Teaching about gender, race, social class and sexuality in criminal justice and criminology classrooms can be challenging. Professors may face resistance when they ask students to examine how gender impacts victimization, how race affects interactions with the police, how socioeconomic status shapes experiences in court or how sexuality influences treatment in the criminal justice system. Teaching Criminology at the Intersection is an instructional guide to support faculty as they navigate teaching these topics. Bringing together the experience and knowledge of expert scholars, this book provides time-strapped academics with an accessible how-to guide for the classroom, where the dynamics and discrimination of gender, race, class and sexuality demographics intersect and permeate criminal justice concerns. In the book, the authors of each chapter discuss how they teach a particular contemporary criminal justice issue and provide their suggestions for best practice, while grounding their ideas in pedagogical theory. Chapters end with a toolkit of recommended activities, assignments, films, readings or websites. 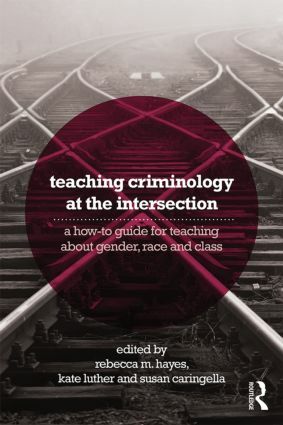 As a teaching handbook, Teaching Criminology at the Intersection is appropriate reading for graduate level criminology, criminal justice and women’s and gender studies teaching instruction courses and as background reading and reference for instructors in these disciplines.